So a couple days after taking a look at Kerm's GameBoy camera with ArTICL, I was supremely impressed with the amount of time and effort that it must have taken to write such a nice library, and thus I wondered what I could possibly do with it. While robotics and other ideas came to mind, one thing stood above the rest. And thus, I present, to the best of my knowledge, the first ever TI84+ controlled by my brain. By the way, you can click on the pictures to enlarge them. Using a MindFlex headset, I first hooked up the transmitting lead of the NeuroSky chip to a daughter system of a nrf24l01 and an Atmega328 mini. Using a nrf24l01 and an Atmega328 mini, the data is first translated and sent wirelessly to a separate receiving arduino. The LED flashes depending on the concentration amount. I took apart the entire MindFlex headset and wired it into a baseball hat, which works just fine. The entire system is then self-contained inside the wooden box. From there, the receiving Arduino Uno reads the incoming data, for now just the simple attention and meditation data, and then sends it via AtTICL to the calculator, in addition to printing certain information out on the inexpensive 5110 LCD. Although it is really not that advanced by any means, I just thought it would be a fun project to enjoy. If anyone is interested, I can show a video or some code or something. What do you think? PS: For those of you wondering about Portal, I decided to take a quick break... And study for finals. But next week is the 20th. Mateo's Ultimate Calculator was powered by my laptop. The Arduino Uno was powered by a wall outlet, and the Atmega328 was powered by the 3 AAA batteries in the case. This is so cool! You should transform it into some sort of helicopter game! Or Mario! How much information can you get out of the sensor? My understanding of these devices is they do poorly-specified things with the EEG signals coming in and generate some kind of probably-bogus "attention" or "meditation" (as mentioned in the OP) signal which is a simple scalar. It's not very well-suited to games, because it's very hard to specifically control any of the measures, certainly not with enough precision for a platformer. The "games" these things are used with are usually along the lines of "focus really hard and make the box hover for a while". 4x administrator response combo! This is a very cool project indeed, and I'm particularly impressed that you managed to make ArTICL do what you needed with almost no consultation with me. I hope that means that the examples are reasonably clear and/or that the code is somewhat self-documenting (besides its tribute to your coding skill, obviously). Like Tari, my previous research on these sort of consumer devices suggested that the accuracy or granularity is shady at best, so I'm curious what your experiences have been with the relationship between your mental activity and the values the sensor provides. Personally, I have found that it actually works rather well, even though it is really just a simple toy. It appears to work as promised, although at first it takes some getting used to. There is no "fine control", but you can definitely get varied responses depending on what you do. The signals that you can read are signal strength, attention, meditation, delta, theta, low alpha, high alpha, low beta, high beta, low gamma, and high gamma waves. Not exactly specific, but it definitely works. Thanks! I have the original NeuroSky MindWave. Whilst I've had a number of problems getting it to work in the past, when it has worked, it provides "attention" and "meditation" data. It seemed to work quite nicely, to be fair. As for the MindFlex, my understanding is that it's the more academically oriented version of the MindWave, but I'm not too sure what it does differently to the MindWave. Unfortunately, that's a bit out of the range of even current research-grade brain activity interpretation hardware and software, as far as I know. Mateo: have you gotten around to those clearer pictures and that video that you mentioned? Now, I guess I need to explain it a little. 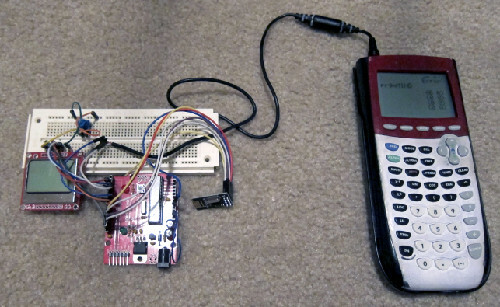 The first part demonstrates the serial connection to the calculator, which is not currently requesting anything. Then, when I switch on the transmitter, the data is sent wirelessly to the arduino, which then prints this data back to the computer, which is the numbers that are being displayed. Then, while the test is running, I first begin by closing my eyes, which drops the level of attention quite quickly. Then when I open them, the level rises again. I then lower it again by clearing my mind. Then, at the end, I focus on reaching the top of the screen. It is not too exciting, but it does seem to work correctly. Thanks all! I don't have the other LCD running at the moment, but if you see the above pictures, it is just a scrolling graph of the data that is received. Now, before you get too excited, there are some obvious limitations. You won't be doing math or playing any Cat/Space games with it any time soon. Currently it reads only the attention data, and based on the discussion in the thread, fine-grained control isn't quite there yet. Even with those limitations, this is a wicked cool project! Check it out in the discussion link. Oh cool! Merth, once again, I must thank you! Neat! Hopefully I can upload the actual code in a couple days; depends on how much explanation I want to give things. It would be interesting to see the types of things one could do with this technology. Of course, I'm talking more software than hardware at this point. Stuff like "meditation / attention" levels drawing points on a graph, timing how long your "meditation / attention" levels are at a certain level, and typing numbers based on "meditatiom / attention" levels would be cool. [...]and typing numbers based on "meditatiom / attention" levels would be cool. If you could get two degrees of freedom out of the device, you could try to use your meditation/attention levels to move a cursor around an on-screen keyboard to choose letters/numbers to type, but I'm not sure that this device has that kind of precision and/or granularity, even if you could get more than one value out of it at once. I probably could do something like this. There are multiple signals that both are outputted by the device. The only hard part would be teaching myself how to control it. It also is possible to extract the raw wave data, and thus compute it from there. Probably way out of my league though. Why not change the levels to a cat and add a space background? You know, you could create a real life bf that's uber-complicated to program. You can call me Ernesto Agapíto Garcés con ya de Abelar. Google is ok. This is way cool! i wish i could learn this kind of stuff. There are 285 users online: 12 members and 273 guests. Members: bobtheferret, danielricci, GregsAStar, Jeffitus, matkeller19, Pi_Runner, readroof2, Sam, TimmyTurner62. © Copyright 2000-2019 Cemetech & Christopher Mitchell :: Page Execution Time: 0.173620 seconds.